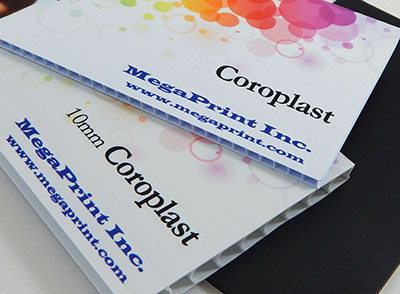 We give you a choice of matte or gloss photo paper. Both are 45 lb weight, more than twice that of normal copier paper. Photo Gloss paper has the shiny look of a glossy photo. The matte paper is just that, it will not give reflections. Colors are more vibrant on the Photo Glossy paper, but only slightly so. It is also a little more expensive. 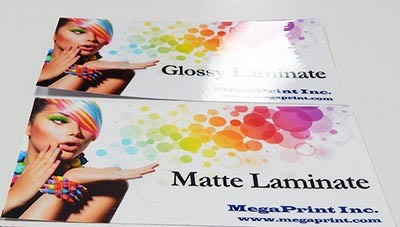 We offer both matte and gloss lamination. 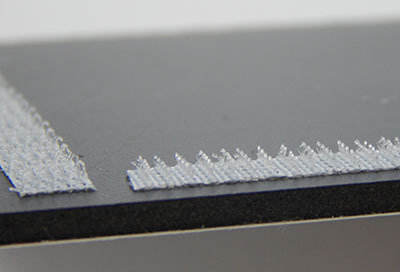 Both are 5 mil thickness and applied to both sides of the print. 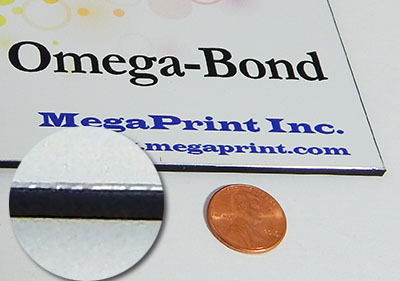 We normally give you a 1/8" sealing edge around the print. 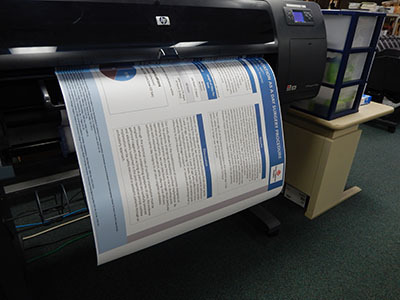 We print on matte paper when laminating. 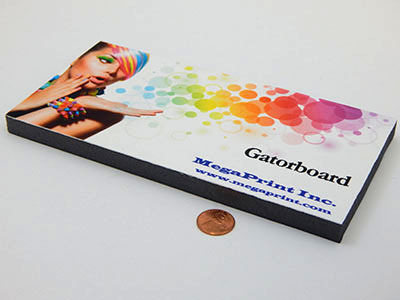 Matte laminate won't give you reflection trouble, gloss lamination makes your colors "pop". 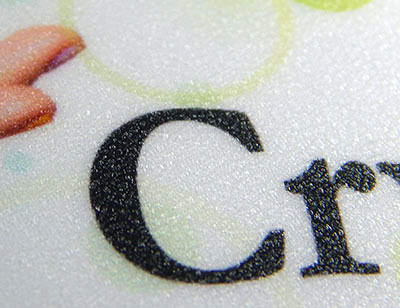 For trade show displays, we recommend crystal lamination. It's an extra heavy material with a textured surface that lets the colors through beautifully but breaks the glare of trade show lighting. Total thickness of crystal laminate on matte paper is 23 mils. All our laminates are hot applied, so they won't tunnel when rolled tightly. 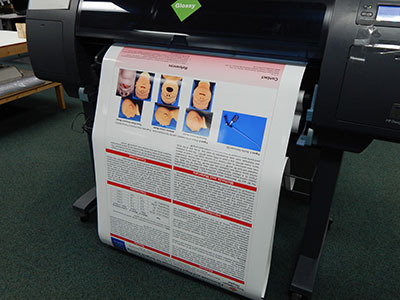 We can mount prints to a number of flat materials, and we can print directly onto them with our UV printers. 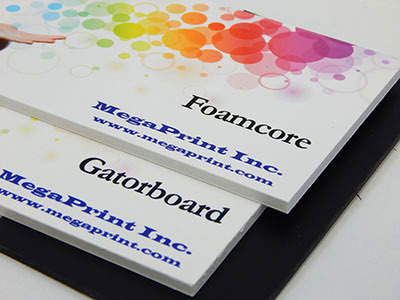 Foam Core Board is a slice of styrofoam 3/16" thick with a paper front and back. Gatorboard is the same styrofoam core but with a tough layer of moisture proof paper on either side. It's tougher and doesn't bend with changes in humidity. We can also furnish Gatorboard with a black core, and for direct printing we use either white or WBB (white face, black core and back). WBB gatorboard comes in both 3/16 and 1/2". 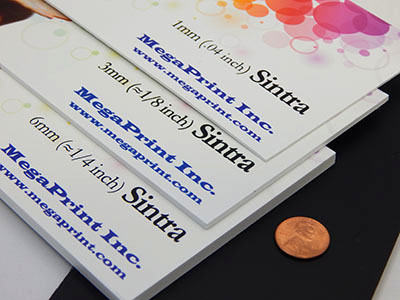 Shown here is 1/2"
Sintra is a foamed PVC sheet that we stock in 1mm, 3mm, and 6mm thicknesses. Those are .040, 1/8, and 1/4" respectively in English units. 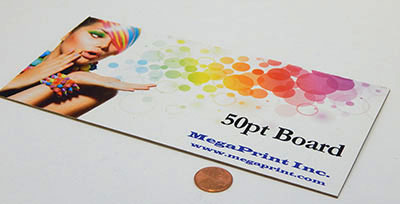 Typically we print directly on it with our UV printers. 50point board is our choice as a mounting material for photos going into frames. It's thin (50 mils, a little less than 1/16 inch), so it doesn't take a lot of space in your frame. We can direct print onto 50 point board that is 100 recycled and can be recycled with your cardboard for a completely green signage solution! Use it for 22x28 sign holders and point of purchase displays. For longer term signs, we print on OmegaBond, which is 1/8" of high density polyethylene clad with aluminum on both sides. We print a lot of trail and kiosk signs on this material. 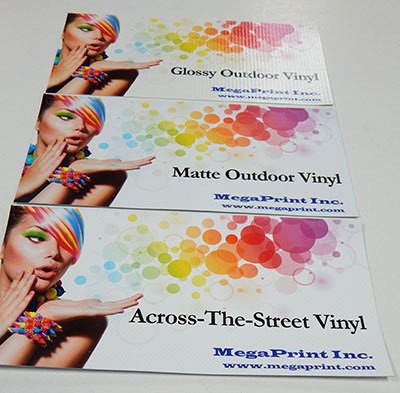 We stock 13 oz glossy vinyl and a 15 oz matte finish banner vinyl. Use matte whenever you are indoors, since it won't give you reflection trouble. We use it a lot for backdrops. Outdoors, gloss will look better longer since the shiny surface sheds grime. We also carry an 18 oz Across the Street Vinyl banner that should be used wherever the banner will be exposed to wind loads. It has an extra heavy nylon scrim layer that adds strength. It's also good in cold weather to -20 degrees F. Both matte and ATSV have a light blocking layer. 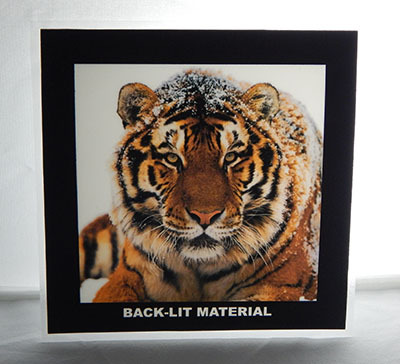 For backlit printing we use an 8.7 mil HP Vivid Color Backlit Film. The results are stunning! For applications that require a heavier material, we will laminate with our crystal laminate. This gives a total thickness of 23 mils for installation in trade show frames. 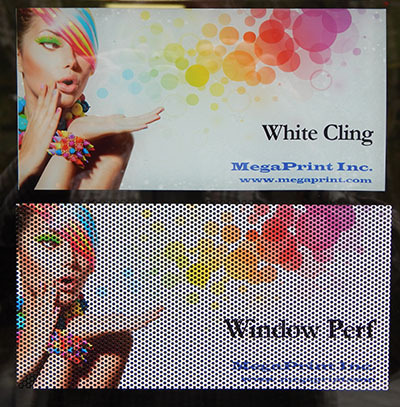 We carry both white and clear window cling, and a 60/40 perforated window vinyl. The cling can be applied with either side facing out. Users should be careful about clear cling, since what is normally white will be clear. 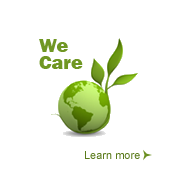 Talk to us if you want to use clear cling. Cling sticks to the window with static electricity, not an adhesive. The 60x40 perf has black on the adhesive side, and is printed on the white side, usually applied on the outside of the window facing out. Window perf allows someone inside to see out, but shows an image to viewers outside. The 60x40 designation means that the material is 60% vinyl, 40% holes. We can apply VELCRO® Brand hook and loop fasteners to the back of many of our materials for attachment to carpet faced trade show booths, among other things. 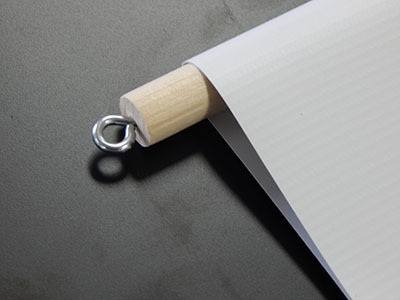 Our standard for trade shows is to put 1/4" wide hooks on the perimeter of the back of your print. We can also furnish the loop side of the VELCRO® if you need it. 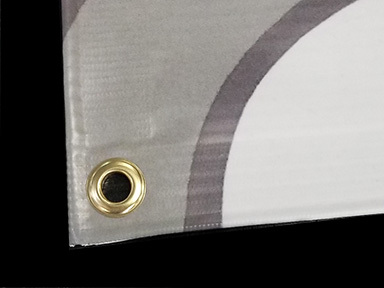 We can hem your banner and drive grommets every two feet around, or put a pole pocket in the top and bottom to hang it on a pole. 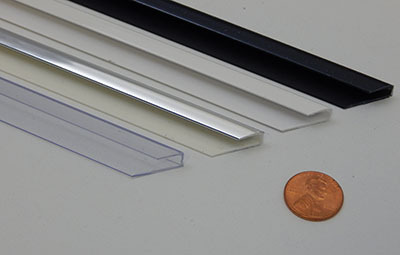 Protect the edges of Foamcore and Display Board prints with this plastic edge trim. 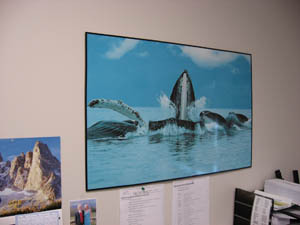 Large format prints are easy to smack into door frames and trunk metal. Edge Trim takes the punishment, keeping your prints looking fresh! It comes in black, white, silver, and clear. 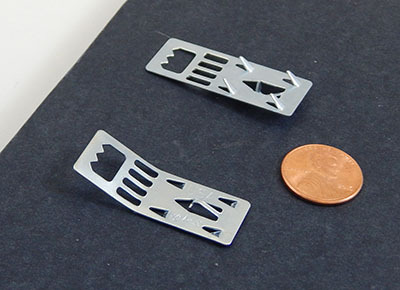 Foamcore clips give you a means of hanging Foamcore and Display Board prints.